When AOL bought hyperlocal news site Patch in June, 2009, it covered five towns in Connecticut and New Jersey. On Tuesday, it will open its 100th Patch, and by the end of the year it plans to open 400 more for a total of 500. I recently visited AOL’s headquarters to learn more about what Patch is all about. “We look at what we are doing as digitizing towns,” says Patch president Warren Webster (see video interview below). Patch was first founded and funded by AOL CEO Tim Armstrong when he couldn’t find a resource on the Web for volunteer activities his family could do together in the small Connecticut town where he lives. Armstrong bought Patch afterwards when he came to AOL, but only took back his initial investment in AOL shares—and he is obviously very interested in the product. He stuck his head in the conference room where I was getting my demo because he saw the Patch screen projected on the wall. Matching volunteers with local organizations is still one of Patch’s features, but its main focus is covering local news and creating an in-depth directory of local businesses and places of interest. 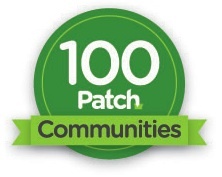 Each Patch covers a small town with a population between 15,000 and 75,000, places like Fairfield, Connecticut, Mill Valley, California, Scarsdale, New York, and Morristown, New Jersey (which will be the 100th Patch). The front page covers local news much like you would find in a local small town newspaper (“Police Investigate Drowning,” “A Guide To Walkable Westchester,” “Coyote Attacks Another Young Girl In Rye, Bites Neck“). Each town has its own editor, a “walking newsroom” who writes stories and assigns them to an average of 11 freelancers, who also fill out listings in the directory and take photos. There are also events, announcements, and volunteer opportunities. Readers can add their own. But the real engine of Patch is the database it is building up of local businesses. So far it has 105,000 local listings, and is building out more every day. Before Patch launches in a town, it creates a directory of the local businesses, parks, hospitals, schools, and other public places. It launches with about 1,200 for each town, which get entered into Patch’s structured database. Each place gets its own profile page on Patch, with a description and highly detailed data such as teacher/student ratios for schools or suggested dress code and parking options for restaurants. For instance, here is directory listing for the Crabtree Kittle House & Inn in Chappaqua, NY. The local directory of places is how Patch makes money. If a business wants an enhanced listing, complete with a video tour (shot by one of the 40,000 freelance videographers who work for another AOL acquisition, StudioNow) and preferred placement, that costs $1,000 a year. Patch is going after Yellow Pages and local newspaper advertising dollars. These profile pages are very search-engine friendly, and any time a Patch article mentions a place in the database, it is automatically linked. “A lot are using their Patch profile as their place on the Web,” says Webster. Patch also offers a self-serve ad tool that turns any directory listing into an online ad unit which can be used on any Website and link either back to their Patch listing or to their own site. Webster explains Patch’s rollout in terms of phases. The first phase is to get up and running in hundreds of towns and get local residents engaged. The goal is to reach half of each town’s population. “We exceeeeded every metric we had set for ourselves,” boasts Webster. “Phase 2 is how do we get people to buy things from local stores.” That is where the coupons and local deals come in (you saw that one coming). The coupons are shown as ads on the homepage of the towns where the businesses are located, as well as on their directory listings. The local coupons are still pretty primitive compared the experiments we are seeing from geo startups like Foursquare and shopkick, but Webster hints that a mobile Patch app is coming soon. And when I asked about whether the directory would become available to other developers and startups through an API, he notes that could be coming soon as well: “We are looking at every possible way to distribute Patch content.” Once Patch gets into gear, it could definitely start driving a whole new class of advertising revenues for AOL.